OK, this question might be slightly more appropriate for the materials forum, but I think this is a fairly basic situation. basically three sets of three. object one has three identical meshes. object two has three identical meshes. object three again, three identical meshes. all nine of these meshes are to use the same two materials. what I can’t seem to get around is that every time i go on to the next object to apply the materials, the first material seems to go as I would expect it to. 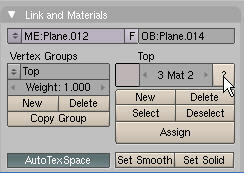 but when I attempt to apply the second material to the other part of the mesh I have to create an entirely new material! can’t I just apply the second material from my list? I must be missing something. the funny thing is that once the new material that i don’t need is created, i can go back and change it to the one i wanted it to be in the first place. i just have this spare material. would i be correct to assume that each object must have it’s own set of materials. in other words, the materials are not universal, but rather object-specific? No, more than one object can use the same material. You say each object has 3 meshes, and each of these meshes will use 2 materials. 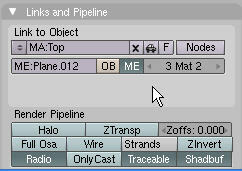 Have you defined 2 material indices in the “Links and Material” panel? Are you changing to the second material index in the “Links and Pipeline” panel? See the attached pics - the first shows the “Links and Material” panel for the object, the second shows the “Links and Pipeline” panel for the material. This particular object has 3 materials. Any of which can be applied to any other object.